At the beginning, before everything went wrong and his mother died, he was boy with no name. The villagers only knew him as "Asta’s son" and that had to suffice. It was only when his mother died and his world fell apart that he discovered that he did in fact have a name, Crispin. He also discovers that the steward of his village seems to want to get rid of him, and that he has some secret in his past which is highly dangerous. In terror poor Crispin runs from the only life he has ever known. He has never left his village before, does not know how to read or write, and knows almost nothing about the outside world. Worse still he is now a runaway and the steward has named him a "Wolf’s head" - a criminal who can be killed on sight. Soon after leaving his village Crispin is forced to join a travelling entertainer and from this large, brusque man the boy learns many things. Together they travel towards a large town dodging the steward and his men and hoping that that they will be able to survive the secret which lies in Crispin’s past. 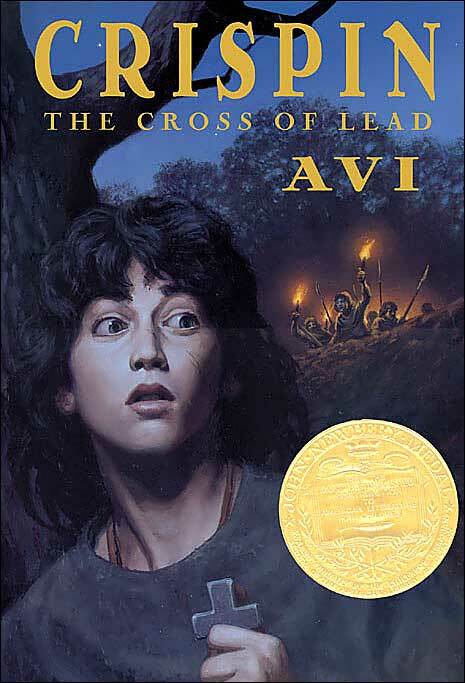 Avi gives us a very grim picture of life in the 1300’s, one filled with oppression, cruelty, fear, hardship, and a vigorously enforced class system. It is startling to learn how little freedom the common man had and to realise how much we take for granted in our lives today. At first Crispin sees himself as being "bad, as one who is being punished by God for some unknown sin. He prays for help and guidance, and is willing to take what life throws at him. Over time however we see him come to terms with the fact that he has a certain amount of control over his own destiny. He has to seize such control and run with it, making what he can of his own life. We see the pitiful boy grow up into a young man who takes risks and who fights for what he believes in. It is this growth and change which is such a joy to watch and rejoice in. In this extraordinary book Avi catapults us back in time, to a place and an era which most of us would hate to experience. He creates vibrant and touchingly human characters whom we can identify with and he shows us the frailties of human nature, most of which are the same today as they were in the 1300’s. At the back of the book the reader will find a "Historical Note" by the author which describes the time in which Crispin lived and what England would have been like in 1377. There is also an author interview and a glossary.